Be your own bride with these classic silhouettes and dramatic details. See more wedding dresses from the fall 2018 collection by ROMONA. Ball gown with low square neckline featuring a low square back made of Mikado, shown with belt and dramatic asymmetrical bow by ROMONA. Strapless fluted gown made of Mikado featuring a draped sweetheart neckline, shown with a three-quarter sleeve guipure flowered lace overblouse by ROMONA. 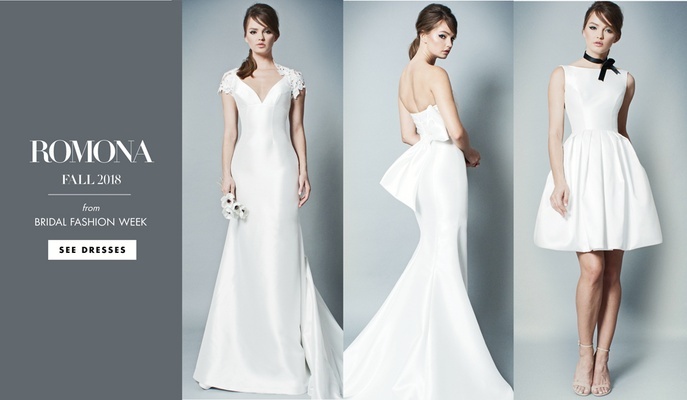 Strapless fluted gown made of Mikado featuring a draped sweetheart neckline, shown with a Mikado belt and dramatic asymmetrical bow by ROMONA. Strapless fluted gown made of Mikado featuring a draped sweetheart neckline, shown with a Mikado belt and dramatic asymmetrical bow as well as a Guipure flowered lace capelet by ROMONA. Silk shantung gown featuring a sculpted neckline and low couture dropped waist accented with covered buttons to end of bodice and shown with a three-quarter sleeve Guipure flowered lace overblouse by ROMONA. V-neck gown with fluted chapel-length skirt made of Mikado, shown with Guipure flowered lace cap-sleeve shrug by ROMONA. Short dress made of Mikado featuring a boat neckline and full skirt by ROMONA. Short dress made of Mikado featuring a sweetheart neckline and full skirt, shown with a Guipure flowered lace capelet by ROMONA. Sweetheart draped gown featuring a ball gown skirt with chapel train made of silk shantung, shown with a silk shantung belt and dramatic asymmetrical bow by ROMONA. Sweetheart draped gown featuring a ball gown skirt with chapel train made of silk shantung, shown with a Guipure flowered lace cap-sleeve shrug by ROMONA. Continuing her Romona line this season, designer Romona Keveža introduced the fall 2018 collection at her bridal market presentation. Featuring a variety of timeless silhouettes and accessories suitable for a wide range of wedding types, this young line encourages women to be their own bride. As such, the collection focuses on confidence and being an individual. The gowns were simplistic, yet beautiful. She worked with clean lines and minimalist shapes, but all with a feminine charm. Along with the gowns showcased in the Romona label, Keveža also offers lace tops, a lace shrug, and a detachable bow, so brides can individualize their gowns. See the latest styles and accessories in the slideshow above! For more from Romona Keveža, view her fall 2018 collections for Legends Romona Keveža and Romona Keveža Collection. Discover additional wedding gown inspiration by viewing more collections from bridal fashion week here. Also, be sure to check out our extensive photo galleries, which feature images of the wedding gowns chosen by real brides.